Preheat oven to 180°C, gas mark 4. Line a large roasting tin with 2 extra long sheets of foil, covering all the sides and base. Line the foil with greaseproof paper. Place the sliced onions in the roasting tin and top with 1 of the sliced garlic bulbs. Pour over the white wine. Mix the oil with seasoning and dried oregano then rub well into the lamb. Place the lamb on the onions. Cover over with greaseproof paper and foil, sealing the ends well. Place in the oven and cook for 3 hours. Open up the foil and greaseproof paper. Add the potatoes, stir into the juices, then add the sliced lemon and remaining garlic. Stir once more until well coated. Re-cover tightly and return to the oven for another 2 hours. Meanwhile, make the sauce. Toast the coriander seeds with the cumin seeds then lightly crush with a pestle and mortar. Mix with lemon juice, extra virgin olive oil and roughly chopped mint or flat-leaf parsley. Stir into the yogurt and season to taste. Cover and keep chilled until ready to serve the lamb. 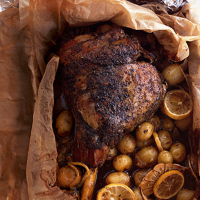 Transfer the lamb to a large platter or board, cover and keep warm while the meat rests. Meanwhile, spoon the potatoes and lemon into a bowl then pour the lamb juices and onions into another small bowl. Serve with the yogurt sauce.